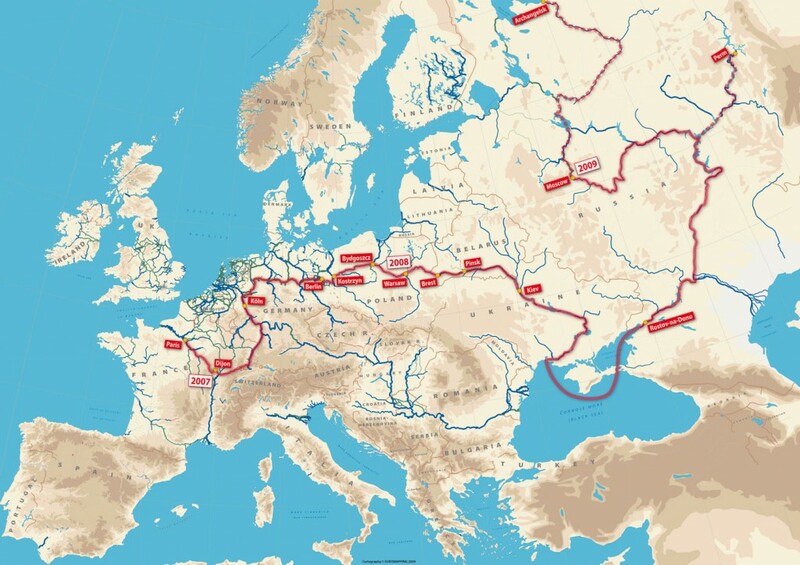 In just a few years, three bottlenecks on the eastern borders of the European Union will have been removed, thanks in part to the persistent efforts of many organisations working together, campaigning and lobbying for canals, waterways and inland navigation. First to be completed was the restoration of the Augustowski Canal in Poland and its continuation in Belarus’ through to the Neman river, opened in 2009. The second, long-awaited, development is the construction of a permanent lock in Brest-Litovsk at the western end of the Dnieper-Bug Canal (see map in header). 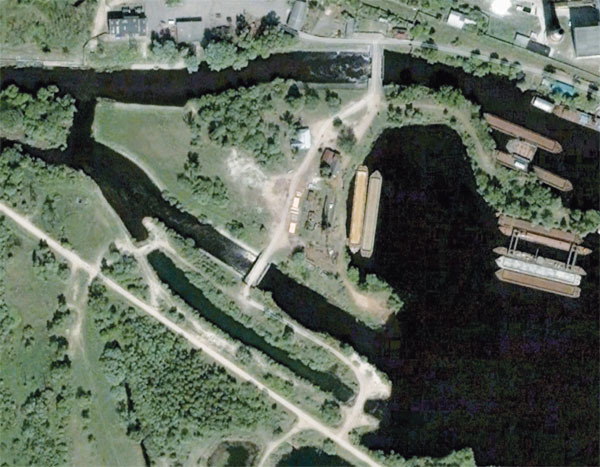 This lock should replace in 2012 the temporary earth dam structure which for many years blocked through navigation to Poland’s Bug River. Finally, the canalised river Bega will be opened from the Tisa in Serbia through to Timosoara in Romania; again work is in progress on restoration of the first lock in Romania. Our exhibition From Limerick to Kiev: Waterways for Tomorrow’s Europe contributed to promotion of these projects by showing in 2003/2004* how an integrated European waterway network is a concern for tourism and long-distance recreational boating, just as it is a concern for industrial and economic development through inland water transport. 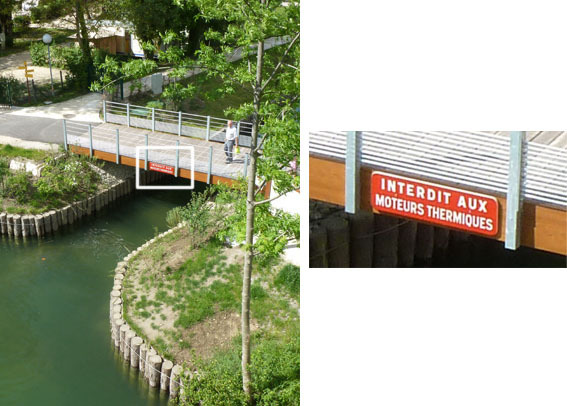 The exhibition map and panels were also shown at the boat lift at Strépy-Thieu in Belgium in 2004, and at a session of the Working Party on Inland Waterways at the United Nations Economic Commission for Europe in Geneva. Boatowners have for long been planning long-distance cruises throughout the continent, as shown by this planning map for the cruise of a lifetime from Paris to Moscow, Perm and Arkhangelsk. A complementary issue is that of regulations for crossing that eastern border (or ‘internal border’ in the case of Serbia-Romania); discussions are in progress and outline agreements have been reached, one having been signed recently in Warsaw by Poland and Belarus’, but in practice there are still substantial administrative hurdles to overcome. Such cruises have now become feasible, at least in terms of reglementation, since the Russian Federation passed a law on May 25th allowing foreign recreational boats to use its inland waterways. 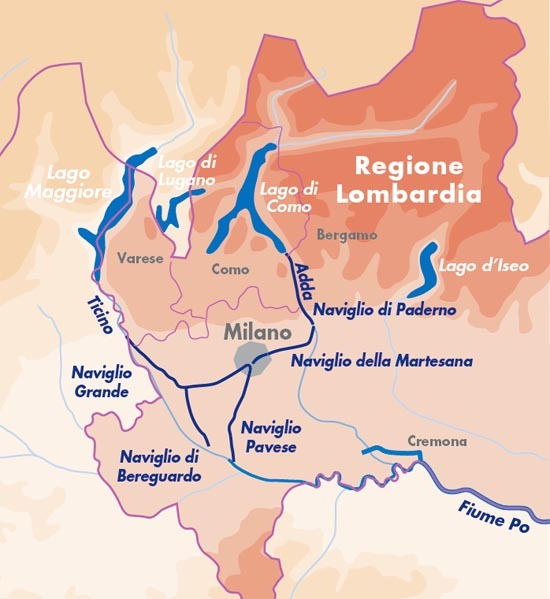 Barge owners and operators will contribute up to half of the cost of building the 106km long Seine-Nord Europe canal through the toll levied by the canal’s future private-sector operator. Two approaches were discussed at a meeting on April 18 in Ghent, bringing together VNF, Waterwegen & Zeekanalen (Flanders) and Service Public de Wallonie (Wallonia). The first, proposed by the project partners, involves charging more for goods that are ‘captive’ or most likely to be carried by water, such as agricultural products, bulk minerals and metals, and less for goods more difficult to win from road and rail, such as containers. The carriers argued on the contrary for a toll indexed on the value of the cargoes. 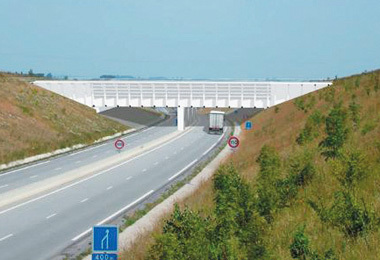 The proposed tolls range from €2 to €4.90 per tonne, according a report in the French magazine NPI – Navigation, Ports & Intermodalité. 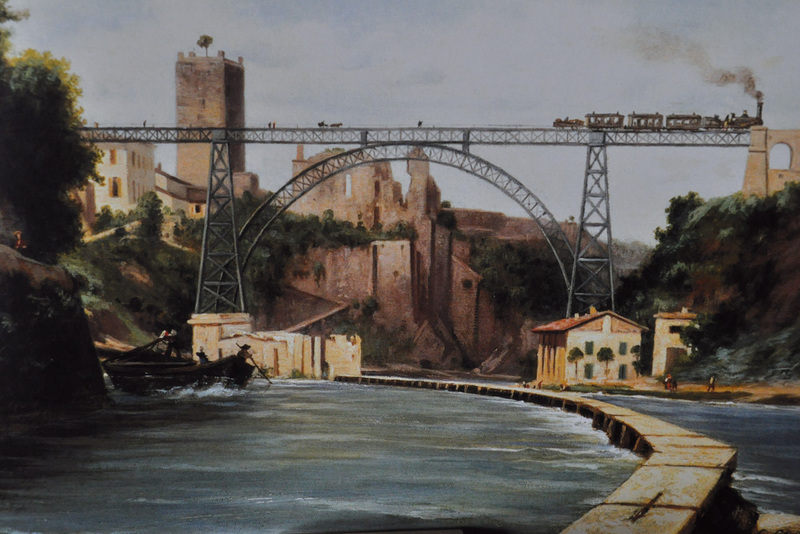 These tolls were set at a level corresponding to 30% of the saving in transport costs offered by the canal. This means that the carrying industry will retain 70% of the benefit of the reduction in transport costs. 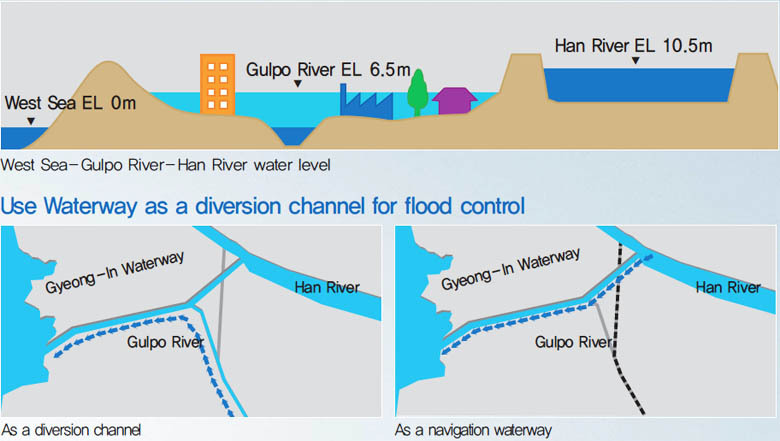 It remains to select the private-sector partner to design, build and operate the waterway, although the competitive dialogue process should be completed in the coming weeks. Chanaz harbour an ill-conceived development? It is sad how ideas conceived with the best of intentions by local politicians sometimes go hopelessly wrong because their implementation is dictated by trends and political expediency. Visiting Chanaz on May 6, I discovered this impressive addition to what is already a superb site, and one of my top 10 waterside villages in France. This is at the western end of the Canal de Savières which links the upper river Rhône to Lake Bourget. You see this ‘lakeside village’ and think ‘the architects had fun there’. You see hundreds of people enjoying the site on a glorious May day. Then your attention is drawn to the fine pontoons complete with water and electricity points. And you wonder why none of the chalets has been rented, and why there are no boats in the harbour? Then comes the explanation… and the disappointment, at least on the second observation. Access to this idyllic harbour is open to electrically-powered boats only (as well as unpowered craft), as shown by the sign on the swing-bridge over the harbour entrance. The only electric boats present in the region are open boats for hire by the hour, and would not be clients for such an installation. So it seems that the mayor and his council have either been misled by the designers of the project, or have given in to pressure from environmentalists or government departments. 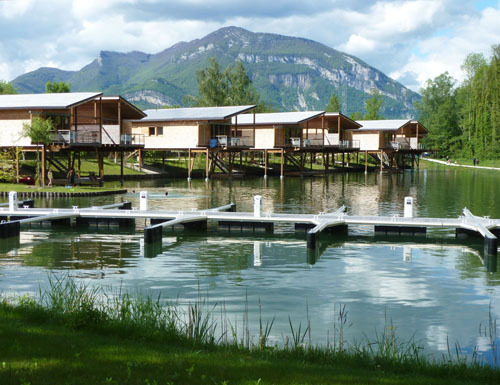 By excluding nearly all powered craft, the harbour and its pontoons are rendered practically useless, and that part of the total investment of EUR 1.8 million will be sadly wasted, while the ‘regular’ moorings along the backwater of the Rhône at Chanaz are fully occupied with many boats on the waiting list. European regulations on boat engine emissions and noise (through the technical requirements for inland waterway craft) are increasingly stringent, so excluding boats from this harbour is a misguided choice. ‘The evening reception in the aqueduct, the “Dinner in the Ditch”, made a lasting impact. It still echoes in the community. Thanks to our sponsors, partners, and hard work of the planning committee the WCC was a world-class act of the highest caliber in program, content, and social events. Today we should build on the conference’s success and keep the momentum. ‘We must not let the lessons learned and the ideas discussed wither and die. Now is the time to consider our City’s future while building upon the past. We need to use this opportunity to leverage other urban waterway development initiatives from around the world, not just our old Erie Canal and aqueduct. ‘Consider our history: America’s first inland boom in the early years was fueled by the construction of the Erie Canal. If not for the canal, Rochester would not be what it is today. The mid-1800s expansion of the second Erie Canal, the Enlarged Erie, through the City created the 1842 aqueduct (Broad Street Bridge) that still stands today, the only intact old Erie Canal urban aqueduct on the system. ‘By the early 20th century Rochester had outgrown the canal and when the fourth Erie Canal was completed in 1918 it took an end run around the city and the old canal bed was converted into a subway by roofing over the canal trench with Broad Street. The subway operated from c.1925 to 1956 when it too faded into oblivion. ‘The projected rewatering is all about turning historical features into engines of economic revitalization. Cities around the world have restored or are planning to restore their historic waterways: in Korea, Japan, China, France, Belgium, the Netherlands, England, Denmark,… North America is no exception as waterway projects, bristling with successful economic revitalization, have been completed in a number of cities: in Montreal, Oklahoma City, Providence, and San Antonio. The fact that water restoration projects have been successful in so many different countries proves that it is a cross-cultural phenomenon and a primal basic instinct uniting all of humanity: attraction to water. ‘Rochester decision-makers are unable to commit to major public investments in the current climate. Yet developers know that waterfront property is more valuable; there are no substitutes for waterways in urban settings as engines of economic revitalization and regeneration. Imagine what it would be like to live, walk or eat dinner right next to the water on Broad Street, as you can do in Pittsford or Fairport. 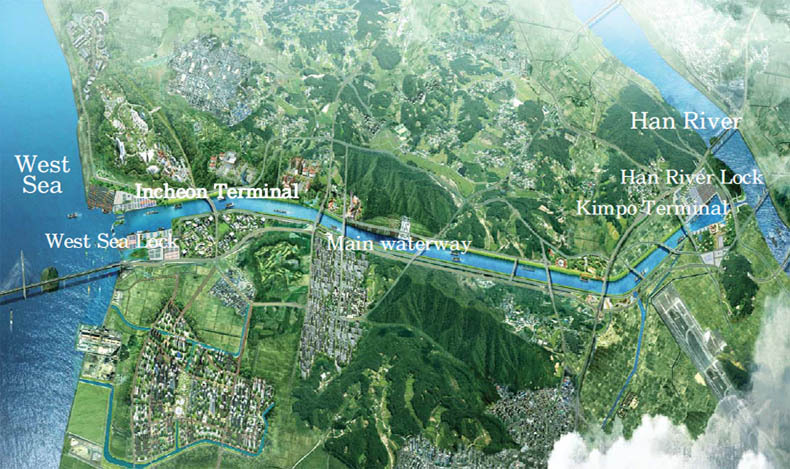 A waterway with boats and a wide promenade is a magnet for housing, shops and restaurants, bringing new jobs. ‘Canal Development is a proven money-maker; the British have made significant investments in canals to revitalize urban areas. In his book Britain’s Restored Canals, Roger Squires points to restoration as a catalyst for economic growth : over $12 billion equivalent has been derived from canal redevelopment. ‘To keep this project alive, we must keep up the pressure, but it is a constant struggle. 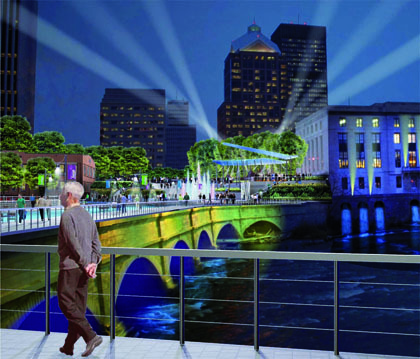 An overwhelming majority of the delegates at the 2010 conference urged us to continue bringing the old Erie Canal to life again through downtown Rochester. We have received messages of support from the Chairman of British Waterways, and Jim Stirling, engineer, who led the BW team that built that the Falkirk Wheel in Scotland and restored the two canals that the Wheel united. He stated in the September 24th 2010 issue of the Democrat & Chronicle that a canal brought back to life is a like a magnet that draws people and businesses such as pubs, marinas, as well as light commercial developments and residences. ‘This economic model can work in a city like Rochester! Magical canal and waterway restorations have converted a no-go industrial canal wasteland in Oklahoma City, virtually nothing but a streetscape, into something wonderful and really special. We in Rochester also have the opportunity to accomplish something truly exceptional but with the added value of brand-name recognition. Restoration of the iconic old Erie Canal will have a robust economic impact on the downtown Historic Old Erie Canal District corridor and the city as a whole. Canal history has handed us a gift : we have, cradled in our hands, an enormous opportunity to achieve something truly special. Who among us can envisage consciously taking something so special and, in direct contrast to Oklahoma City, transforming it into absolutely nothing? Parks Canada’s heritage canals are open as usual this year despite the severe budget cuts imposed on the organization. It was announced by the Minister of the Environment the Hon. 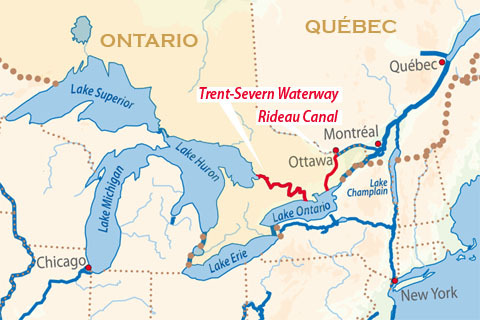 Peter Kent on Friday May 18 that the hours of operation for the heritage canals in Canada will remain the same for this year. In his statement he also stated that the daily hours of service will be impacted next year. This most recent announcement was in response to the reaction and feedback from business and community leaders who would have been impacted directly by the previously announced possible changes to the length of this year’s navigation season. The comment by the Minister of changes next year will still be of concern to the businesses, communities and users of these wonderful canal and waterway systems. So expect to see and hear more on this subject over the coming months. 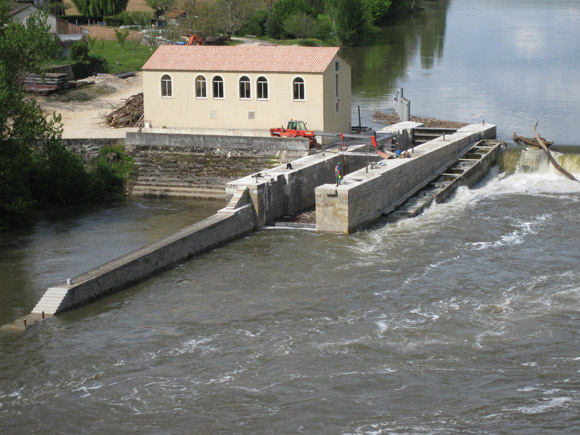 There is much concern in many parts of Europe, and especially on the secondary waterways in France, about maintenance of canal banks and the related issue of dredging. As author of the European Waterways Map & Directory, I adopted for that overview map the classification proposed by PIANC in 1999. This was later endorsed as UNECE Resolution No. 52, at the initiative of several organisations, including the European Boating Association. This classification focuses on boat size overall, i.e. Because of the sensitivity of dredging, I have adopted a different approach to categorising waterways in the new Imray map we have just completed. I know Inland Waterways of France is misleading by giving the ‘official’ draught, and one member of sister organisation DBA The Barge Association wrote to me about cruising on the Canal de la Robine as being closer to agriculture than navigation! We are now proposing the following legend for this new French map. So the thickest line corresponds to high-capacity waterways, generally offering a draught of at least 2 m. Then comes the commercial Class I or ‘Freycinet’ waterways, offering 1.80m in principle. 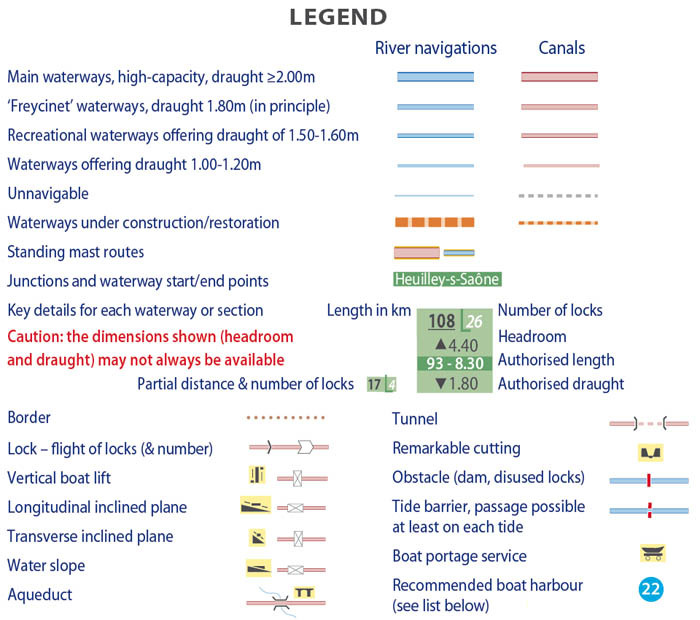 The third category is recreational waterways offering a draught in the range of 1.40-1.60m, while a thin line without dark edges corresponds to waterways where the design draught is 1.00-1.30m. And we place the clear caveat: Caution: these dimensions (headroom and draught) may not always be available. I believe we cannot be too literal in plotting all the anomalies throughout the network, that’s not the job of a simple overview planning map. … and all who use them! Welcome to IWI’s blog! The association, founded in 1995*, aims to raise awareness of the value of navigable rivers and canals in many of the densely-populated regions of the planet. Lobbying for governments’ attention and spending on waterways for moving freight and all their other functions is a constant challenge. The other transport modes carry more weight in corporate terms, while tourism and recreational uses are considered by many decision-makers as ‘secondary’ functions, to be planned and managed at the regional or local level. So not only are we in a minority as voters in elections, we are also promoting widely differing types of waterway and economic uses, with separate political levels of responsiblity and decision-making! As with any lobbying organisation, a lot of work is conducted behind the scenes. All who wish to join in are more than welcome! Details on our Membership page. These public pages will cover a wide range of topics, many derived from the web sites we have been managing for the last 15 years. We look forward to working with you in furthering the cause of sensible spending to build and maintain inland waterways for their many economic, environmental and social benefits.